Now you can launch join.me meetings directly from your team’s Slack channels. The join.me-Slack integration provides a logical (and highly requested) launch point for join.me meetings. By posting /joinme into a Slack channel a join.me session is created, and the corresponding viewer link and session data (including dial-in numbers) is pushed out to all group members. Viewers need only to click that meeting link to instantly connect to the join.me meeting through their browser. 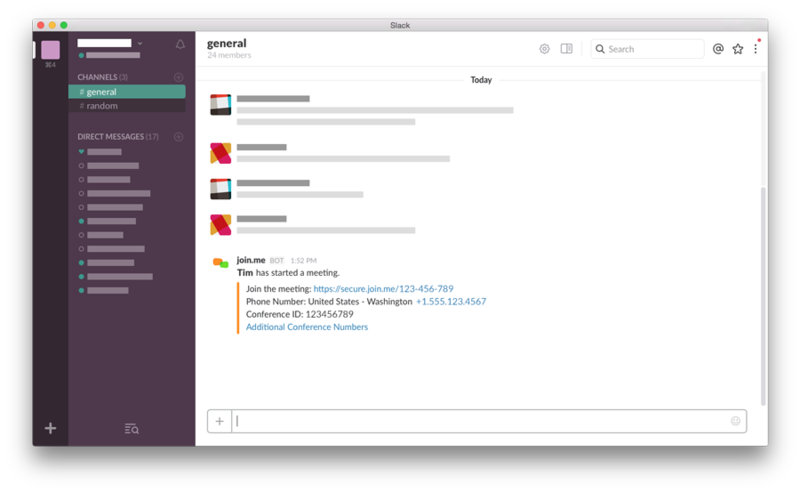 The join.me-Slack integration adds screen sharing, audio, and video to any Slack channel. Current join.me users can link their accounts seamlessly with Slack. New join.me users can sign up for an account to be used via Slack as well. Need some help? Check out our help page. Let join.me make Slack even better.